Once considered the “Russian Riviera,” Ukraine’s Black Sea coast stretches like a gorgeous turquoise ribbon along the Crimean peninsula. Despite its seemingly endless, dramatic cliffs, breathtakingly beautiful beaches, and nearly perfect climate, this vacation paradise has remained largely unknown to tourists outside of Eastern Europe. And the jewel in this crown of the Ukraine? 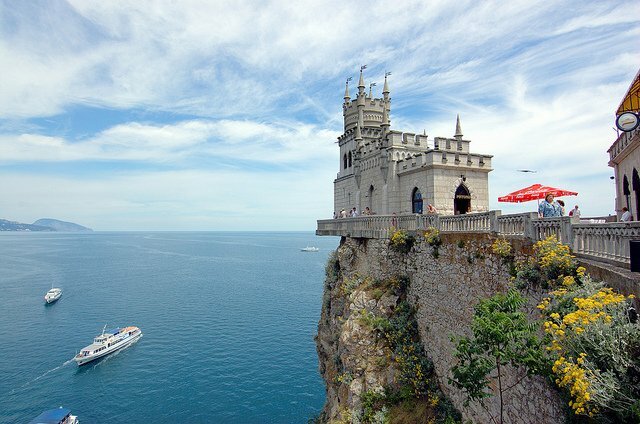 It has to be Swallow’s Nest Castle, the tiny Neo-Gothic gem lightly perched on Aurora cliff overlooking the Crimean Black Sea. The first structure built atop Aurora cliff was a small house that was constructed in 1877. Legend has it that the owner chose this spot because of the perfect peace and privacy it afforded him. Ownership of the property passed twice: once to a physician of the Russian Tsar in 1895, and then to a Baron von Stiengel. The baron hired architect Vsevolod Sherwood to build a romantic castle on the cliff, and in 1910 Swallow’s Nest — sometimes called the “Fortress of Love” — was born. Because the elaborate turrets, pinnacles, and battlements of this remarkable structure were created for decorative, rather than protective purposes, Swallow’s Nest is not technically a castle. However, there’s no doubt that this tiny masterpiece would make the perfect home for any fairytale princess. On first sight, Swallow’s Nest looks like it could easily slide right into the Black Sea. Built on the very edge of the cliff, some of the balconies and patios actually stretch beyond the earth and hang directly over the water. This very precarious position might be the reason why the castle is so small; it stands just 40 feet high and contains only a few rooms on two floors. Despite its delicate appearance, the castle is structurally sound. In fact, it survived a severe earthquake in 1927 without suffering a great deal of damage. The cliff itself was not so lucky — it cracked under the stress of the quake, and Swallow’s Nest was closed for 40 years due to the vertical crack in the rock beneath it. In 1968, engineers secured the crack with a large concrete plate. The castle was treated to some extra support from anti-seismic belts, and it was re-opened as a restaurant in 1970. Following another major renovation in 2011, Swallow’s Nest Castle became a public museum. Elegant and seemingly weightless as it hovers over the Black Sea, Crimea’s “Fortress of Love” is now 100 years old. It stands today as a fairytale reminder of days gone by, and a symbol of the jewel-like beauty of the Crimean Black Sea coast. Martin, great blog and very ifmtrnaoive! So ifmtrnaoive there are bits I wouldn’t mind keeping in a folder for future ref. But printing is difficult as half the page gets chopped off! Don’t know if anyone else has mentioned this or if you are particularly PC-lit (I’m not!) but have you considered a printable view’ button that squishes it all into one page width? Maybe another reader (more techy than me) can advise on this ? Swallow’s Nest is a magical place! (Especially if you can ignore the thousands of not-always-polite people all hiking up the cliff stairs at the same time as you). When I was there with my mom (we’re from Ukraine originally) she told me that a rich man (maybe the baron?) built this castle for his daughter, and that it was taken away from their family when communists took over.